Poppy Seeds - Laurens Grape Single, 4" blossoms in a mix of plum, purple, amethyst, violet and magenta! Noteworthy to say the least! 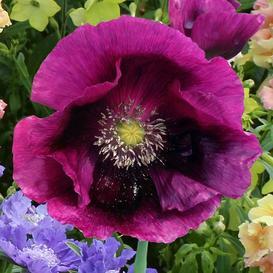 Lauren's Grape Poppy is a hardy annual, producing up to 5 blooms per plant. Once established, can tolerate sun, shade, cultivated or neglected conditions.